So, who is Barbara Jensen? Aside from a well-manicured Facebook page that was only recently started on February 10, 2014, not too many people seem to know who she is or where she came from. Does it seem odd that someone so public, who professes to be an active member of the community, and who makes a living with technology didn’t have a Facebook page? Strange, but I digress. Jensen certainly has made waves recently with a series of unauthorized and unwelcome radio commercials on Salem radio station 1430 KYKN featuring Jensen showcasing her Christian values in support of local area 501(c)3 non-profit organizations. Jensen stated she wanted “voters to see her Christian values in action.” The radio spots caused quite a stir as many believe the commercials sound like political endorsements for Jensen, something charities like Union Gospel Mission, Oregon WWII Memorial Foundation and Keizer Heritage Foundation are forbidden to do by law. 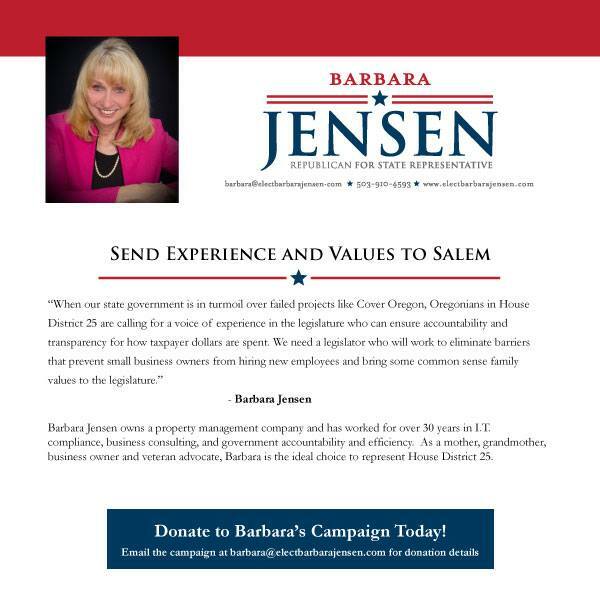 Jensen’s ads contained misinformation about the charities and displayed poor judgment from Jensen and her campaign handlers. Even after the Statesman Journal broke the story on April 24, 2014, Jensen’s campaign did not pull the hotly opposed endorsements from the airwaves. So, does it sit well with Conservative voters in Oregon HD25 that Jensen used such a tactic to win their votes? Regardless, the charities she “endorsed” will likely have to perform some damage control as a result of Barbara Jensen’s actions. Meet Caleb Hayes of Pac/West. Hayes’ area of expertise is political campaigns. He has plenty of experience in his young career. 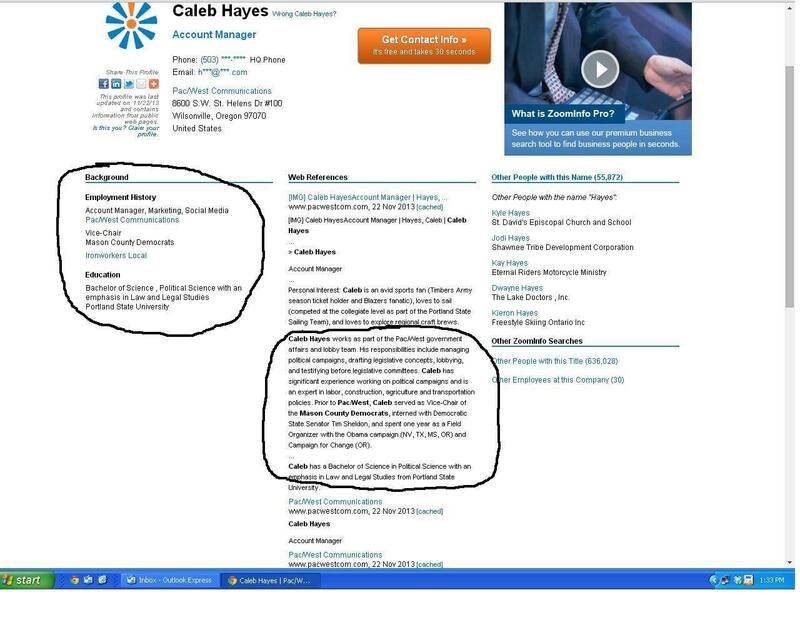 Hayes worked as a “Field Organizer for the 2008 Obama campaign (NV, TX, MS, OR) and Campaign for Change, managed field training for AFL-CIO, served as Vice-Chair of the Mason County Democrats, [and] worked for Democratic State Senator Tim Sheldon (WA).” (See screenshots made to make Hayes seem more Conservative). 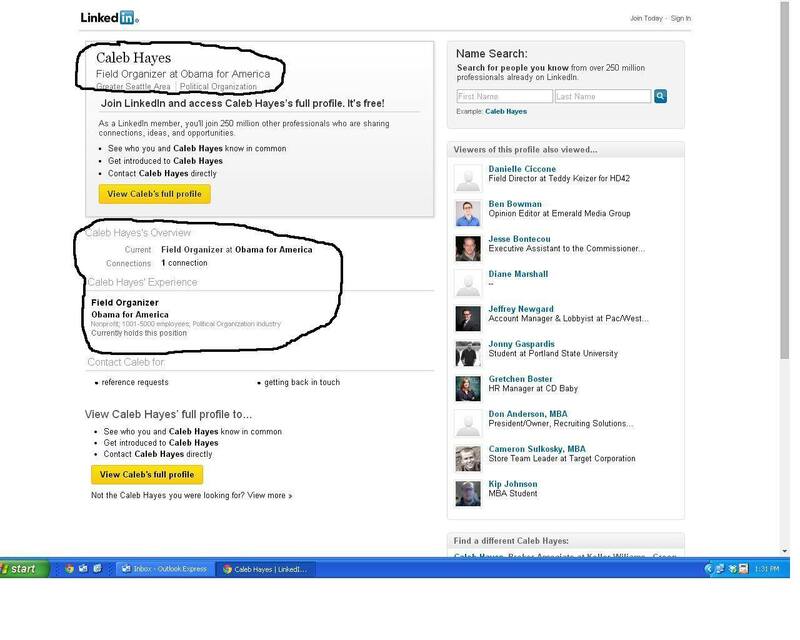 Caleb Hayes – Pac/West Caleb Hayes, part of Barbara Jensen’s political campaign, has worked for the 2008 Obama campaign, Vice-Chair of Mason County Democrats, AFL-CIO Union trainer, and Democrat Senator Tim Sheldon (WA) Caleb Hayes – Scrubbed Profile After the connection between Hayes and Jensen was made, Hayes’ Pac/West profile was scrubbed to make him appear more Conservative. The problem? We were watching! After people began making the connection between Jensen (professing Conservative) and Hayes, Pac/West quickly scrubbed his profile to make Hayes seem more Conservative and aligned with Jensen’s “values.” When asked about the connection, Jensen stated, “Mr. Hayes has been tasked to do some work in my campaign . . .” To most Conservatives, it seems more than strange that a “Conservative” candidate would have someone of diametrically opposed values working on her campaign. It smacks in the face of reason – hire someone to help you who helped Obama get elected. Really? Jensen waxed poetic about workplace discrimination because of differing political views – Except Hayes is not her coworker. He is a hired contractor. A universal truth: Oil and water do not mix. Mr. Hayes’ Democratic values are incompatible with Conservative values. I find it difficult to comprehend why Jensen would choose to use Hayes on her campaign – Are there no Conservative campaign workers to choose from? Jensen’s campaign managing company Pac/West is not without controversy. For example, an article titled Pac/West Communications is Cheating Alaskan Voters, the author accuses Pac/West of dishonest practices concerning several legislative issues with “factually incorrect statements” on distributed print ads, etc. The author cites Alaska Lt. Governor Lowell Thomas Jr. as stating, “These scoundrels deserve to pay a large fine and go to jail for deceiving the Alaskan voters the way they have . . . We feel that truth in advertising laws should not exclude them just because it is a political issue.” Finally, the author states, “[The Pac/West] strategy clearly depends on avoiding any kind of close public scrutiny prior to the election.” One has to wonder why Barbara Jensen would choose to align herself with such “expertise.” Again, most Conservatives I know would not choose to align themselves with people who do not share their values. This leaves a couple deductions: 1. Jensen didn’t notice the opposing political values and controversy surrounding her political campaign organizers, in which case it demonstrates Jensen has a lack of discernment. 2. Jensen knew exactly who she was hiring to run her campaign, which demonstrates Jensen will employ Democrat strategists when it suits her. Either case is a loser, and Conservatives deserve better. In Jensen’s political ad, she points to the failures of state government, specifically failed “projects like Cover Oregon.” Oregon has been building capacity for CoverOregon for many years as a result of the Affordable Care Act (Obamacare). On Jensen’s LinkedIn page, she highlights her stint as a Project Administrator for the State of Oregon’s DAS. Jensen states she administered a technology and health policy program to meet Federal requirements. Some people have asked her on social media if her position linked to Cover Oregon. If so, could her expertise have saved the failed Cover Oregon website? She sure makes it sound as if she could. Another quick peek of Jensen’s LinkedIn page shows her long history of government employment. She has worked 36 years as a government employee in one capacity or another. Conservatives already know what we get when we elect seasoned government employees to political office – more government! Conservatives are more interested in citizen legislature, which is regular people from the community who stand up and say, “I will serve.” Those regular folks do not decide to serve to become lifelong politicians; they go to serve for a short period to try to shrink government’s reach into the lives of their friends and neighbors – and that is how it should be. Elect a government employee – get someone beholden to their friends in government. Elect a regular citizen – get someone beholden to the citizens. Educate yourself before you cast your vote! Ryan Waddell holds a Doctorate in Business Administration and is a Conservative Christian living in Oregon.